(Louisville, KY)- Today, four prominent Kentucky leaders spoke out about an alarming new report that reveals the majority of America’s young adults fail to meet criteria demonstrating they are citizen-ready members of society. The Citizen-Readiness Index reveals the state of Kentucky received a grade of “D” based on the percentage of young adults in the state who are workforce-ready, law-abiding, and able to defend our nation, should they so choose. 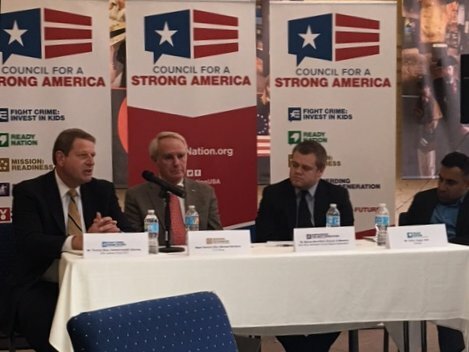 The report was released by Kentucky members of the nonprofit Council for a Strong America at the American Revolution National Headquarters, in a panel discussion moderated by Major General (Ret.) Robert Silverthorn, U.S. Army. General Silverthorn was joined by Major General (Ret.) Michael Davidson, U.S. Army, a member of Mission: Readiness; Thomas Wine, Commonwealth’s Attorney for the 30th Judicial Circuit, a member of Fight Crime: Invest in Kids; Ankur Gopal, CEO of Interapt, a member of ReadyNation; and Marcus Burchfield, Director of Missions at New River McCreary County Baptist Association, a member of Shepherding the Next Generation. The panel discussed, in depth, the three factors that affect citizen-readiness. One was the impact of childhood abuse and neglect on future criminal behavior. Research has shown that approximately half of all adolescents who have been arrested for delinquency in one study had experienced some form of abuse or neglect during childhood. Another key factor the panel weighed in on was the importance of providing access to high- quality early education. Exposure to such programs reduces the chances a child will be held back in school, drop out, and become involved in crime. The numbers bear this out; across the nation, 7 out of 10 prisoners do not have a high school diploma. National security was also a focus for the panelists, who discussed the current shortage of young Americans eligible to serve in the armed forces. Obesity, criminal records, and insufficient education are just some of the troubling factors keeping young people from qualifying for military service. STRONG FAMILIES, must be supported through Congressional reauthorization of the Maternal, Infant and Early Childhood Home Visiting (MIECHV) program. This service enables at-risk parents to receive short-term coaching from a nurse or trained professional on how to provide their children with a safe and healthy start in life. MIECHV has broad bipartisan support at the federal and state levels, As Majority Leader, Kentucky’s own Senator Mitch McConnell (R-KY.) is in a unique position to ensure this program continues. We urge him to prioritize reauthorizing the MIECHV program to ensure families don’t lose these critical services. QUALITY EARLY EDUCATION, must be maintained through reauthorizing and improving the Head Start program and continued support of Preschool Development Grants, which allow states to create, grow, and improve their early learning programs. HEALTHIER SCHOOLS, must be supported by upholding progress made on aligning school meals with the latest nutrition science and restoring physical education in public schools across the nation. The “Citizen-Readiness Index” was prepared by Council for a Strong America, a national, bipartisan, nonprofit uniting organizations comprised of five pillars of society that promotes solutions to the challenges preventing Americans from being citizen-ready. The organization’s more than 9,000 members are law enforcement leaders, retired admirals and generals, business executives, pastors, and prominent coaches and athletes.